Since 1987, magazines like Washingtonian, Remodeling Magazine and Qualified Remodeler as well as professional associations such as the National Association of the Remodeling Industry have recognized Merrill Contracting & Remodeling as one of the area’s leading general contractors for creativity, historic preservation, craftsmanship, professionalism and active participation in the Northern VA community. Although Merrill has won some of the remodeling industry’s top awards, we’re still one of the most approachable and easy-to-work with builders you can find. That’s because our goal isn’t to win home remodeler awards for ourselves, but to delight our clients with home remodeler projects that turn out even more wonderfully than they’d hoped. And perhaps that is why Merrill consistently wins the recognition we value the most: the coveted Guildmaster Award recognizing superlative customer satisfaction with every aspect of working with Merrill, from concept through completion. September 2018 – 50th customer in a row said we deliver exceptional service! What does this mean? 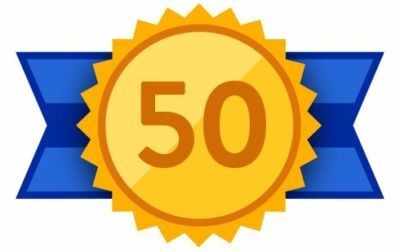 50 customers in a row gave Merrill Contracting & Remodeling the highest possible score in response to GuildQuality’s “Likely to Recommend” question. Merrill has won both national and regional Chrysalis Awards for remodeling projects recognized as some of the best in the nation by judges who are editors of publications such as Better Homes & Gardens, Woman’s Day’s Home Remodeling & Makeovers, Southern Living and Sunset. Merrill’s award-winning projects have been for home additions and whole-house renovations, including in Best Addition Over $250,000 (awards for South Region and a National Award) and Best Whole House Renovation $100,000-250,000. 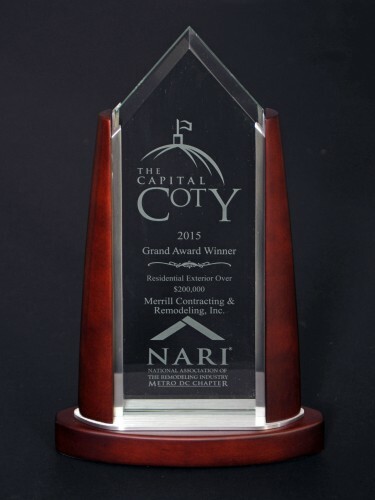 Merrill has been earned multiple Contractor of the Year (CotY) awards which recognize NARI members who have demonstrated outstanding work through their remodeling projects. 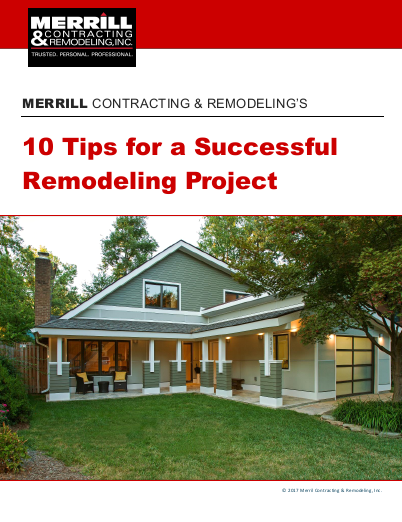 Merrill’s award-winning remodeling projects have been in the categories of Entire House Remodeling $250,000-500,000 (two awards), Home Addition $100,000-250,000, and the Grand Award for Residential Exterior Under $100,000. In its annual rankings in 2009, Remodeling magazine recognized Merrill among the top full-service remodelers in the entire United States. 2009: Ranked 130 of the Top 550 Full Service Remodelers in U.S.
One of the most coveted awards in the remodeling industry, Remodeling magazine’s BIG 50 Award can only be given once to any remodeler, and each year just 50 remodelers are honored nationwide. Merrill has held this lifetime award since 1997 in recognition of the firm’s role in taking the industry to new heights through extraordinary management, marketing, design, and customer service. Merrill’s professionalism and good business practices have consistently placed the company on Qualified Remodeling’s list of the Top 500 Biggest Remodeling Firms — the longest ongoing recognition program in the remodeling industry, including five consecutive years from 2004-2008. Three times, Washingtonian has named Merrill one of the area’s top design/build remodeling firms. Merrill has twice been honored by Arlington County’s Historical Affairs and Landmark Review Board for local remodeling/renovation projects that are sensitive to historic preservation, design, and craftsmanship. Through Arlington County’s Green Home Choice program, Merrill has been recognized for excellence in creating green remodeling solutions that save money, provide healthy indoor environments and reduce environmental impact.